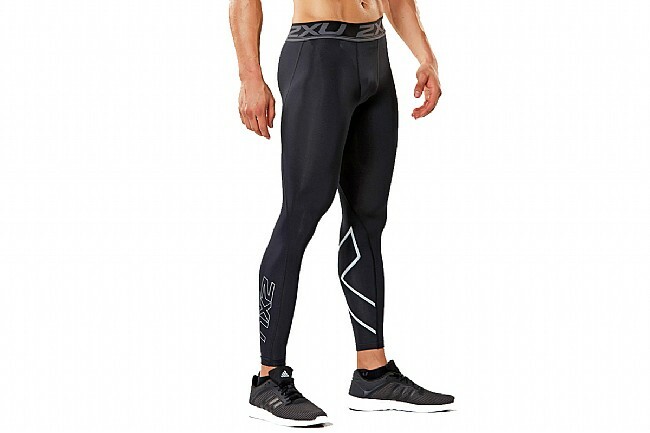 2XU’s Men's Accelerate Compression Tights are designed to enhance agility, improve muscle alignment, and expedite muscle recovery between workouts. The powerful compressive capacity of these tights comes from 70D LYCRA®, a sturdy fabric that firmly contains muscles to reduce fatigue. 105D LYCRA® makes up the back panel of these tights, providing exceptional muscle stabilisation, reduced vibration, and moisture-wicking, keeping the legs steady and dry. In addition to providing muscle support, these tights were designed to be comfortable. The 2XU jaquard waistband is non-restrictive, ideal for bending at the waist and other activities that require ease of movement. Thanks to flatlock seaming that’s smooth against the skin, chafing and skin irritation isn’t a concern. Waistband: 5cm 2XU jacquard elastic. Fabric (Front): PWX 70D. 72% Nylon / 28% Elastane (Invista LYCRA®). Fabric (Back): PWX 105D. 65% Nylon / 35% Elastane (Invista LYCRA®). Height 4'11"-5'9" 4'11"-5'11" 4'11"-6'0" 6'1"-6'7" 4'11"-6'0" 6'1"-6'7" 4'11"-6'1" 6'1"-6'9"
Height 5'1"-6'2" 6'2"-6'9" 5'1"-6'2" 6'2"-7'0"